The Montreal Canadiens are keeping with their annual holiday tradition of giving back to the community by buying gifts for underprivileged children. For almost a decade, the Canadiens have done it by teaming up with Opération Père Noël, a charity that works with youth centres around Montreal. Opération Père Noël gives the Canadiens letters to Santa and then the players' partners, and other members of the organization, go get the gifts. Geneviève Paquette, the executive director of community relations for the Canadiens, said not all the requests are for toys. "One girl wrote that she hoped she can see her parents for Christmas," Paquette said. "Another little boy asked for a gift card to a grocery store so his parents can buy food." Paquette pointed out winter jackets and shoes were common items on the list. Julie Hemsky, who is married to Canadiens forward Ales Hemsky, is expecting their first child in April, a boy. She said she usually focuses on buying for teenagers but this year she shifted her focus to newborns. "I had tears of joy in my eyes picking out all the little jackets," she said. Angela Price, wife of star goaltender Carey Price, has been participating in this event for several years. She has found her relationship with the initiative change since becoming a mom. "I think giving back, especially to kids, just means that much more since becoming a mom. My daughter Liv, who is 19 months, helped me pick out the toys. It's a family effort." 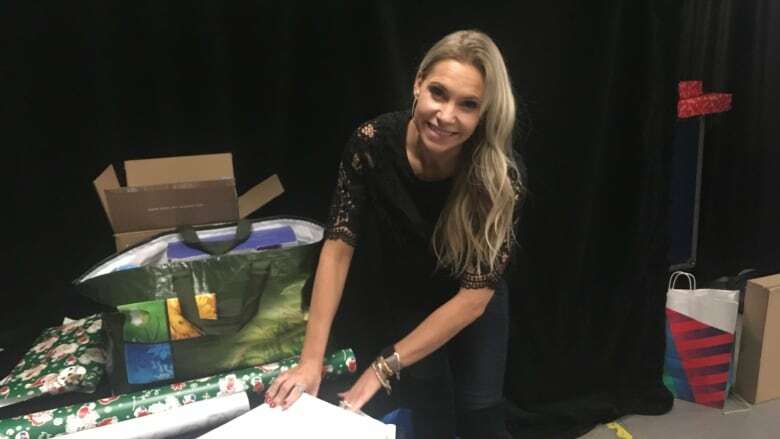 Prior to Thursday night's Habs game against the New Jersey Devils, members of the Canadiens organization were at the Bell Centre, wrapping the gifts and getting them ready to be delivered. Next, those gifts will be handed back to Opération Père Noël which will deliver them to the children on Christmas Day.